Over the past three years I’ve survived without the use of a cell phone. Whenever someone needs to get a hold of me there has always been good old fashioned email to rely on. I never felt the need to be diving head first into a smart phone to keep up with everything happening in the world to the very second, nor did I feel like there were ever things happening that couldn’t wait until the end of the day for me to respond to. I loved not having a cell phone in my hands. I loved the fact that I had nothing to hide behind when bored or stuck in an uncomfortable position. I loved the fact that I could simply enjoy the world around me without being distracted by a buzzing phone in my pocket. However, since being back in Canada, I’ve noticed how much of an addiction the cell phone can be for some people, including myself. Luckily, as I’ve been cruising around some fairly off-the-beaten-path places in British Columbia, I haven’t always had cell service which has forced me to ween myself off of the phone. Even more fortunately, I’ve had great experiences out in the wild to draw myself from even the thought of what was going on along the beaming screen of my iPhone. My fishing trip out of Terrace was one of those perfect escape days. We drifted along the river at the whim of the river dragging out our lines when we could. The buzzing of cell phones was replaced by the churning of the river and the ring with the call of a kingfisher. And really, who needs the excitment of twitter, facebook, instagram and the like when you feel the aggressive tug of a twenty pound Chinook Salmon at the end of your line. I am the self-proclaimed worst fisherman in the world. I had spent a countless number of days out with friends back home as a kid fishing, and I think I only ever caught one fish. In fact, I still remember the first time I ever cast a fishing rod. I reared back with all my strength and flicked the line over my head. But as my arm extended I realized that I hooked my sweat pants (they were cool in the early 90s I swear), and needed to use scissors to free myself from my own line. However, on the river in Terrace I somehow transformed to the type of guy that catches more than just an old boot. In a day, I managed to catch (and release) as much fish as I have ever caught the rest of my life combined. 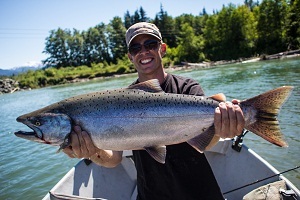 The first Chinook I hauled in weighed a nice 12-15 pounds or so, and the second about 8-10. Although there are Chinook Salmon in that river that weigh in at around 70-80 pounds, I was more than happy with my luck. But the beauty of the day really had nothing to do with the fish at all. It was a reminder that I needed about what it’s like to entrench myself in the moment; to not worry about what call, tweet, or email I might be missing and simply enjoy the wondrous world around me. As great as the information highway that we have in our pockets at all times may be, going with the flow of the river from time to time is what really gives us the recharge we so often need. For me, its these refreshing moments which give pause to life and allow you to really breath in the beauty of our world. Personally, I think the world needs more fishing fishing trips. We all need escapism from the modern comforts which many people can’t seem to function without! This is certainly the idyllic way to do it! Blog Me – You’re so right. I try to get offline at least a couple days a week. It always feels so refreshing when I do. Hahaha… Noah, tech has become your crack! Gadgets are sooo much fun though! I just loved the photos Brendan! Awesome! Thanks Wends – I’m glad you liked these shots! Yeah, great photos Brendan!. Looks like a fantastic spot to relax, get away from things and catch up on life. I love moments like that. Was the perfect way to spend the day Sarah… I really needed that escape!